This morning I wished I had some more time. I know that the breakfast habit is more important than anything when it comes to a healthy diet. But today I did like most other people – I skipped breakfast and grabbed something to eat at work. I have a busy schedule the next couple of days and I already know that I will not get proper food to eat. There is nothing that I can do about it now but I have learned a lesson that makes me think: – How can I prevent this from happening again? The secret answer is: Planning! I need to plan my meals ahead and at least once a week I should plan my meals to ensure that I get proper food. That is a good habit. Why do people skip breakfast? 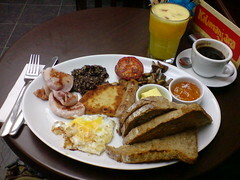 In this post I will stick to the breakfast habit. When the baby screams and the clock I ticking the stress hormones start to take over and mornings often become chaotic for most people. You chose to hit the snooze button instead of getting up on time and where is the other sock? On hectic mornings skipping breakfast is very appealing, but what can you do to make sure you get and enjoyable breakfast? When I look at people’s breakfast I notice that they usually eat the same every morning. Unfortunately people don’t vary their breakfast much. But there are a lot of ways you can make the most important meal of the day more interesting. On the Diet Blog I found [5 Simple Add-ons to Make Breakfast Better]. The author suggests that you add flaxseeds, walnuts, fruit, protein or almond milk to your breakfast. This will surely make breakfast more enjoyable. I have three additional ideas you can do to eat a healthy breakfast every morning. 1. Wake up early and rise when the alarm sounds. 2. Plan breakfast for a week. 3. Prepare breakfast before you go to bed.